Staff Photo by D. Patrick Harding The neon sign of the Big River Grill downtown. 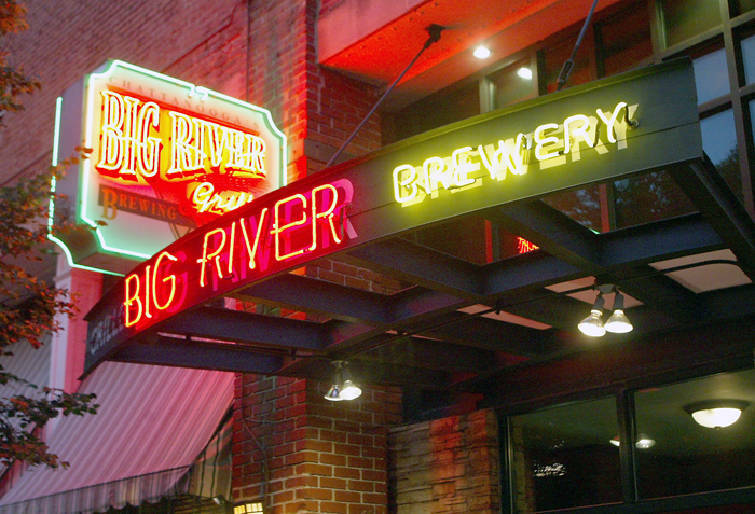 The merger of the Chattanooga-based parent of Big River Grille and Brewing Works and other eateries with a Colorado restaurant company cooks up the nation's biggest operator and franchisor of its kind. "We have similar cultures," said Allen Corey, who heads Gordon Biersch Brewery Restaurant Group, which is combining with Rock Bottom Restaurants Inc. "It makes a lot of sense." The new company, CraftWorks Restaurants & Breweries Inc., will have its headquarters in Chattanooga and Louisville, Colo., officials said about the deal announced Monday. Corey said the unified company will be the nation's largest brewery and craft beer-focused casual dining restaurant chain with nearly 200 owned and franchised locations. He will be CEO of the business and stay in Chattanooga, where most of the senior management will work, officials said. Corey said CraftWorks eventually will have between 75 and 100 people working at its Chattanooga headquarters, up from 45 now. Frank Day, chairman and CEO of Rock Bottom, will be chairman of the new company. Private equity firm Centerbridge Capital Partners of New York acquired both Gordon Biersch and Rock Bottom to create CraftWorks. The purchase price was not disclosed, though Wells Fargo and GE Capital were joint-lead arrangers for a $150 million credit line to support the transaction. "It's a great combination," said Corey, who has headed Gordon Biersch for 13 years. Gordon Biersch will operate through three principal units: Old Chicago, Gordon Biersch and Rock Bottom. It will also operate specialty concepts such as Big River, Bluewater Grille, ChopHouse & Brewery and others. Day said the merger marks a new era for Rock Bottom and Gordon Biersch. He said he is "excited about the potential that the future holds for CraftWorks." Jason Mozingo, Centerbridge's managing director, said the restaurants have "a high-quality offering of craft beer and made-from-scratch food." "We are excited by the prospect of partnering with the management teams to strengthen the long-term operating performance of the business and position it for growth," he said. Corey said CraftWorks could see annual growth of three to six company units and up to 12 franchises in the U.S. The company already has partners in Taiwan and other contacts overseas, he said. Corey said the group plans to implement Gordon Biersch's operating systems in all of the Rock Bottom and Old Chicago units. Gordon Biersch had been majority owned by Hancock Park Associates. Rock Bottom was owned by Day and his investment group. Officials said there are no plans for rebranding or closing any units.